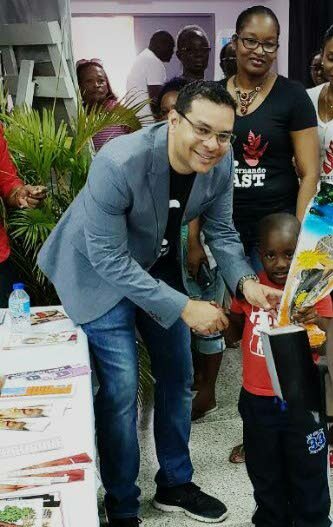 Tourism Minister Randall Mitchell greets a boy at yesterday’s health fair held at the Pleasantville Community Centre. NEW Tourism Minister Randall Mitchell wants to re-brand TT to increase tourists attraction. He has already started meeting with different stakeholders to begin the re-branding process. Discussing some details of the re-branding strategies, Mitchell said there were untouched markets in the country that must be tapped into to increase tourist attraction. The country has a niche market for exhibitions, Carnival, parties and fetes. He said that the tourism sector needs a lot more attention and given 2015 and 2016 low energy prices, there is need now more than ever to diversify the economy and tourism must lead the way. Mitchell said his transition from Housing Minister to Tourism Minister had been smooth. He said his priorities would be meeting with different stakeholders to discuss the way forward. Aside from his ministerial duties, Mitchell assured his constituents that he would make a greater effort to spend more time in his constituency to ensure they received the services they deserved. Director of Health at the South West Regional Health Authority Dr Albert Persaud, speaking at the health fair, announced that several new clinics, which included child development, mental health, child guidance, were to be opened. Persaud also recommended that the Ministry of Health be renamed the Ministry of Health and Wellness. He called for the implementation of systems for proactive health programmes. Persaud said that if people engaged in preventative care, there would be less burdens on the nation’s hospitals. Reply to "Mitchell wants to re-brand TT"